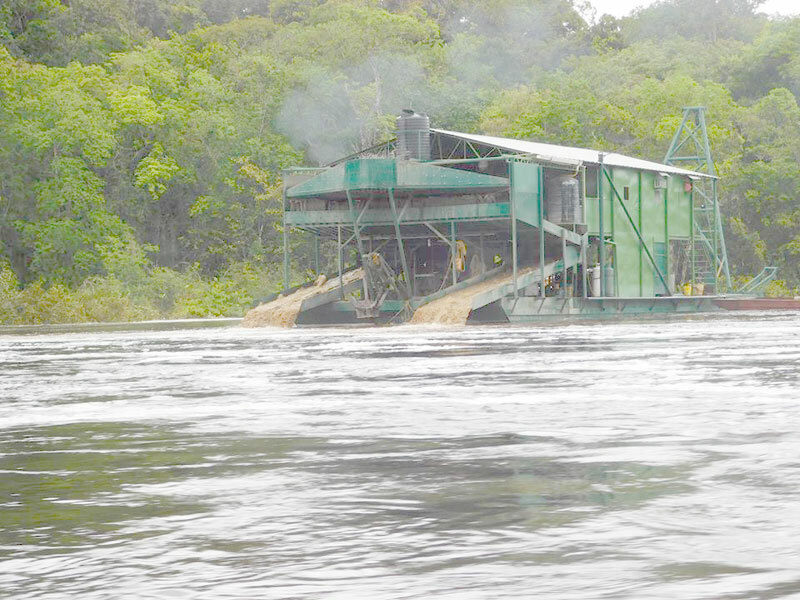 A dredge seen operating at Great Falls, Demerara Falls recently (Malcolm Harripaul photo). Government halted dredging in the Demerara River, yesterday and has ordered a report on the issue. According to a Government statement, Minister of Natural Resources, Raphael Trotman, said he has put a halt to mining in the Demerara River even as his ministry investigates concerns raised by residents of Region Ten, Upper Demerara-Berbice, about river mining. Trotman said he has requested a report on the matter from Acting Commissioner of the Guyana Geology and Mines Commission (GGMC), Newell Dennison. He was speaking yesterday at the opening of the Multi-Stakeholder Committee at the Arthur Chung Conference Centre (ACCC), Liliendaal. “I’ve asked that we not have any mining at all up the river or elsewhere until of course the EPA [Environmental Protection Agency] can certify that this mining is safe,” Minister Trotman said. 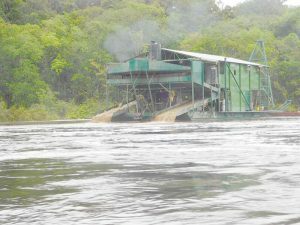 The state-owned Guyana Chronicle reported yesterday that two water draggers (pontoons retrofitted to mine the river bottom for minerals) were detained in Linden. The draggers were reportedly heading to Great Falls, up the Demerara River to mine the water. Residents were concerned about pollution of the water and Regional Chairman of Region Ten, Renis Morian, had written to the president expressing concern over the GGMC granting license to mine without an environmental impact assessment being carried out. Minister Trotman noted that his ministry is treating the matter with all urgency. Last year, the Ministry of Natural Resources prevented mining in the Parish Peak, Upper Berbice following concerns over contamination of the environment. A Biodiversity Assessment Team (BAT) Survey in 2014 had determined that the area is important for biodiversity, as the Upper Berbice River region comprises pristine lowland forests containing diverse and abundant wildlife.